Every business needs a website but few can afford hiring a web agency to design a custom website. Thankfully, the web publishing industry has recognized this need and produced a variety of online services to enable just about anyone to build websites and personal pages easily. Today, we’re excited to dive into more detail about two popular site builders that impress with their elegance and simplicity: Weebly and Strikingly. Note: in order to make my research as much clear, I have tested both website builders with free plans. Strikingly. Strikingly certainly impresses with its simplicity. The builder is very easy-to-navigate and requires no tech skills at all. The builder supports in-line editing providing a full WYSIWYG editing experience. Weebly. Though it has more features to offer than Strikingly, the builder also keeps things elegant and streamlined. In our opinion, Weebly is one of the most well-structured website builders out there. Strikingly vs Weebly. Both platforms have handy dashboards where you can configure major settings of your account, and intuitive editors that let you design your site in a WYSIWYG editing environment. The advantage of Weebly is that it supports drag-and-drop functionality, while with Strikingly new elements are being added to the page through pointing and clicking. Strikingly. First things first, Strikingly from the beginning specialized on one-page websites. But times are changed and now Strikingly is a multi-purpose website builder. But it despite its multi-purpose features, it’s more suitable to creating one-pagers for your business, project or personal branding. What we found immediately when reviewing Strikingly was their focus on mobile design. At any time while you’re creating a website you can switch from the desktop to tablet or mobile view. 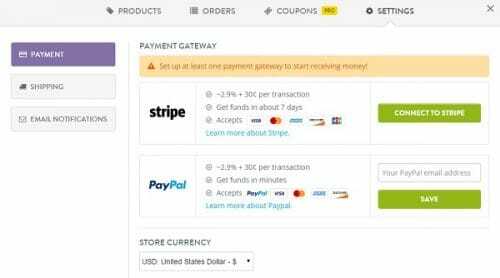 Payment options include Stripe and PayPal. The Order Dashboard in the builder lets you track your inventory, orders and other processes; it lets you export your order data to a CSV file for easy bookkeeping. The Simple Blog feature works similarly to the Simple Store – to activate blogging on your website, add the Blog section to a page and your new blog posts will apear within this section with links to individual blog posts. Weebly. With Weebly, you can create multi-page websites. It’s a versatile site builder that’s mainly used to create blogs, portfolios, online shops and business websites (see our collection of Weebly-based websites). Being one of the oldest site builders (founded in 2006), Weebly has an impressive feature set. Besides advanced blogging and eCommerce which includes mobile commerce, the builder supports membership and multiple contributors. Additionally, there’s a separate version of Weebly for education. Weebly vs Strikingly. All in all, Weebly is a clear winner here. Despite Strkingly makes a great impression and offers a wealth of great features to make the most types of websites. But still, it can’t compete with Weebly that allows for deeper customization. Both site builders offer free mobile apps allowing users to manage their sites on the go. Strikingly. Strikinly offers modern, clean responsive designs. You can customize each theme to a certain extent. Specifically, you can choose from pre-designed styles and edit fonts. Pro users can add Mobile-only features (click-to-call, click-to-text etc.). You can’t switch Strikingly templates. Choosing another template will remove all data from your page. Weebly. Weebly’s collection is bigger. New Weebly themes are fully responsive, and those who use the old ones can take advantage of the built-in mobile editor (this option is only available for non-responsive templates). The good news is that Weebly themes are switchable and you can create a custom theme using Weebly’s HTML/CSS editor. Strikingly vs Weebly. With Strikingly’s limited customization options, you’ll probably spend time customizing your website to give it a unique look. Weebly’s offering is more compelling. Strikingly. Strikingly has an extensive knowledge base, Idea Forum where you can suggest a new feature and vote for existing ideas, and email support. There are also enough prompts in the control panel itself. Weebly. Weebly has a huge help center with many video lessons, how-to articles, livechat and phone support. You can also submit a request via email. Weebly vs Strikingly. In our opinion, Weebly website builder offers more useful help resources. Strikingly. 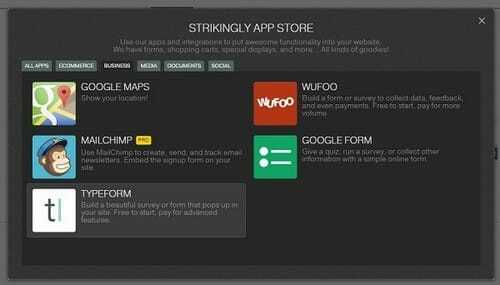 Strikingly is a freemium web service. You can publish as many sites with free features as you want. For advanced customization, there are Limited and Pro plans ($12-$20/mo). Weebly. Weebly also has a free version that never expires. The cheapest paid version of Weebly is $8 a month. The maximum plan is $38/mo. Strikingly vs Weebly. Weebly’s deal looks more attractive. Mainly because you can get a multi-page website without any ads at just $8/mo, while with Strikingly ad-free sites start at $20/mo. After all tests we come to conclusion that Weebly are more favorable choice. But still it all depends on what you need right now and whether you plan to grow your website in the future. Weebly seems to be a safer option, as it lets you add multiple pages at any time, at a lower price.